Update Edit 3: Hey again! I've uploaded a new build of Aircar to the store. Thanks to all the testers who played the last test. I have fixed many of the bugs found and have added a few more features, including support for Oculus touch controllers. If any previous or new tester would like to try the new build let me know! Thanks. Update Edit 2: Thanks again to everyone who has downloaded and tested Aircar. 36 invites have been sent out so far. 31 have been downloaded and installed. To those that have had trouble downloading - check your spam folder and also make sure your invite was not buried in-between your forum activity emails. I have received 15 survey responses so far. Trying to get to 30 survey responses so please fill out the survey if you played! Survey below. The survey responses help me gauge Aircar's technical quality level. I have also received many great suggestions and bugs to be fixed through the survey - some of which I have worked on fixing each night this week of alpha testing. There are plenty more fixes/polish tasks planned for next week. I have received questions about where the game is going and what features are planned for the future. It has taken me one year (started January 2016) to get the game from scratch to where it is right now. The initial goal was to create an immersive futuristic city flying simulator and I feel the game has now achieved that basic goal. I work a full time day job and also have a family. Aircar is my hobby side project. Giant Form Entertainment, my game company, is more or less just me. I've had a concept artist create designs for more Aircars and an Engineer friend give me technical advice. They both also work full time and can only provide limited support to Aircar. One option is to hold the game for another 12 months and implement all the great ideas people have asked for like combat, racing, multiplayer, story and taxi missions. On top of those I would love to add additional full city levels, underground city cavern levels, new aircars with an upgrade/purchase system and customization. I also want to create a fully 3D AI driven traffic system with 10x the density of the current build (no more 2D ships at low altitude) but fully 3D ships everywhere that react to you. I also want a true physics model for the flying mechanics and a dynamic weather system. These are all things I plan to do whether Aircar is released in it's current state or not. 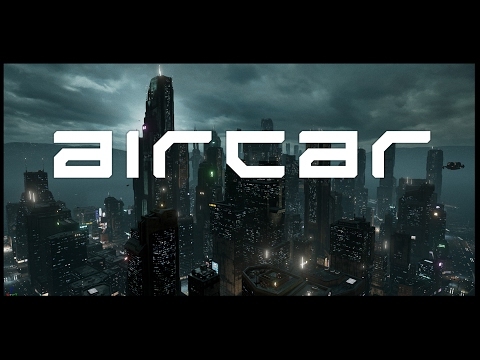 My plan right now is to release Aircar in it's current state as a proof of concept demo. Price (if any) and the release date are up in the air until I get further into the submission process. I also need to start testing on the Vive and Steam VR which will be a separate alpha test build for Steam. Thanks again to everyone who has tested and provided feedback. HOTAS support and control remapping are my two top features to add if the game hits the store. That work has already started and will hopefully be present in an Beta bulid in a few weeks. Looks interesting, I'd give it a go. Invite sent. Please take this short survey after you play. It reminds me of an old game called "G-Police" .. I doubt if anyone remembers it. Invite sent. Please take this survey after you play. Thanks, I will be trying it out shortly and will make sure to fill out the Survey. The look/feel/aesthetic of flying around some kind of Futuristic Cyberpunk city is so cool. It really is G-Police! It ran perfectly as well, no bugs, no frame drops. Are there any plans to add combat to the game? Staple some weapons to this thing and give me some bad guys to shoot and I'll pay full price for it! That looks great. I would be interested in playing. Is this something like HardWar? Also is there HOTAS support? Video looks really good! A mixture of Gotham and Blade Runner City. Could i have an invite? - this looks extremely interesting. Be happy to test it and feedback. Would be happy to test it as well. Thanks. Love to give it a go also, thanks. Didn't watch the video yet, don`t want to spoil the surprise. @Bedhead7 I can try it tomorrow evening if you are still looking for testers. You're the first person I've come across that asks testers to fill out a survey afterwards and I think that's a great idea. People tend to forget to provide feedback even if they enjoyed the game and even when you get feedback it's hard to sort through if it was received via email. Not in this demo, but I agree it should definitely be considered. Currently it works just with the Xbox Controller. I would not mind trying this out.. This looks really cool, love the atmosphere. Has anyone tested using Touch controllers (if all of the buttons map correctly? I'd love to test it out! No touch support, just Xbox controller. Dunno if its a thing, though it would be cool to play something like this with touch and push all the buttons in the cockpit maybe or physically pull the flight stick in the virtual world. Nobody has really done that yet to my knowledge. Hey everyone thanks for the interest and for testing Aircar. Invites have been sent. Please take this short survey after you play and thank you again for testing. I will check the thread midday (im in California) and send out more invites if more people want to test. I will post some answers to questions later today but right now I need to get to my real job...Aircar is a side project I've been cooking up in the evenings. So what engine are you using for this and what do you have planned for the game's main loop? Is this going to be like a flying taxi game or be something more in depth like HardWar? You should get one, double checked and you are on the list. Oculus sends the invites, maybe they are on a delay? Hey, I'd love to give it a try if you have room left! It sends it directly to the email you have registered to your Oculus account. Be sure to check your spam folders as well. Played, enjoyed, survey completed. Look forward to seeing what direction you take this in, love the atmosphere that this has, could use some good sweeping tunes playing while you fly. Great potential.